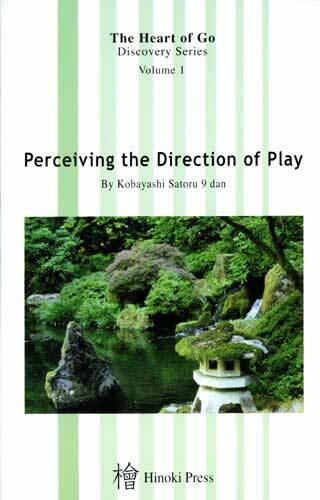 Perceiving the Direction of Play, English translation (by Robert J. Terry) of a book by Kobayashi Satoru, published by Hinoki Press, distributed by Yellow Mountain Imports. 225 pages. The book is volume one of the seven volume The Heart of Go Discovery Series. Thinking About the Direction of Play of the Stones: consists of twenty pages of expository material followed by three games between Sansa and Rigen. These three games are meant to show the difference between local operations prevalent at that time and the whole board thinking that dominates play at this time. The Direction of Joseki: consists of fifteen problems taken from professional games. The Direction of Fuseki (the Opening): consists of fifteen problems taken from professional games. The Direction of Fighting: consists of fifteen problems taken from professional games. White has jumped with the marked stone at this point, leading to a lull in the joseki in the lower right. On all four sides, there are various good points remaining, and first of all, judgement is required to determine which direction is the biggest. Next, what concrete methods should be used in choosing what kind of shape? Reading in the fuseki is required. From the 9th Fujitsu Cup. 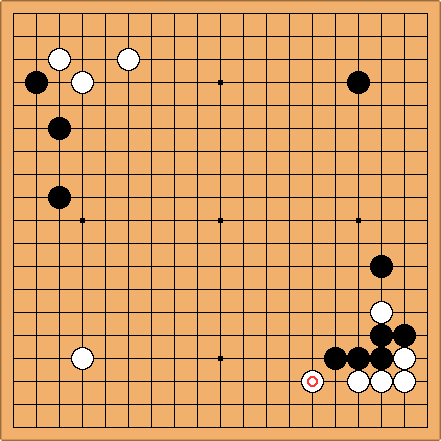 Ma Xiaochun (white) vs Kobayashi Satoru (black). White wins by one-half point.